InteliSecure is a managed security services provider specializing in data protection. With more than 15 years’ experience, 500 plus customers and 2 plus million users, companies large and small rely on our services and specialists to protect the integrity and safety of their sensitive information. We make data security and compliance easy by providing more effective data protection services at lower cost, eliminating the strain on IT organizations, and reducing the risk of confidential information getting into the wrong hands. At the core of every organization’s success are intellectual property assets. 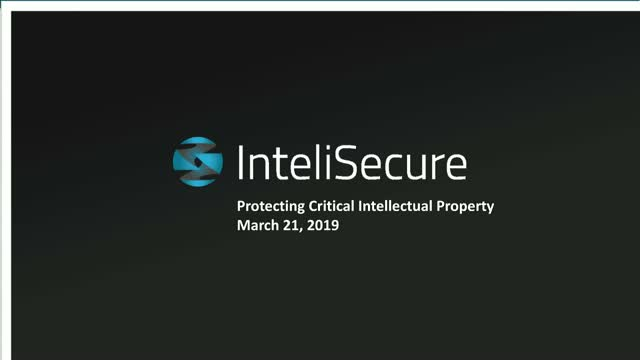 During today's webinar Protecting Critical IP webinar InteliSecure’s CTO Jeremy Wittkop and Forcepoint's Channel Sales Engineer Cosmo Romero will talk about he importance of intellectual property protection and how you can protect intellectual property using both process and technology. The National Institute of Standards and Technology has released an update to their Risk Management Framework (RMF). It is creatively titled RMF 2.0. Notably part of its much longer official name, the framework focuses on taking a “System Life Cycle Approach for Security and Privacy”. What does that mean? Join InteliSecure’s Chief Technology Officer, Jeremy Wittkop [Date and Time] to find out! Despite the best efforts of many well-meaning data security professionals, data breaches are up 75% over the last two years. Every passing week seems to bring a new large scale data breach to the headlines. Most organizations deploy data protection controls to identify and prevent sensitive information loss, but are frustrated by the lack of proactive measures they can take. Understanding open source tools from both an attacker’s and a defender’s perspective will help organizations identify vulnerable data before it is exploited as well as helping to build better response processes. Join InteliSecure Senior Program Analyst, Andrew Miller, and Chief Technology Officer, Jeremy Wittkop as they discuss some of the open source tools adversaries use to attack you, and how you can leverage them to build better defenses.